March 2017 – Minneapolis, Minn. – New trends are revolutionizing the banking industry and Wings Financial Credit Union is committing to the change. With the help of the interior designers at Krech, O’Brien, Mueller & Associates (KOMA), the team is developing a series of new prototypes and prototypical elements to introduce into Wings’ new and existing branches – dedicating themselves to the bank of the future, implementing emerging technologies and the design innovations that support them. It used to be that every time customers needed banking assistance, they would go to a brick and mortar building, sit face to face with a banker and attain their transactions. 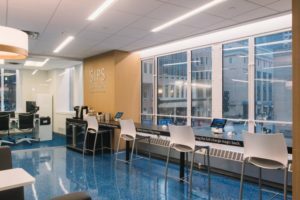 With technology advancing and mobile opportunities more readily available, not every branch requires such a traditional format. Wings Financial recently launched a new prototype integrating these trends. This prototype includes the implementation of Personal Teller Machines (PTM’s), just one of the many technological advances in banking. These machines, while echoing the aesthetics of an ATM, allow a customer to not only complete cash deposits but to also complete other transactions , for example anything from a mortgage inquiry to a small business loan. 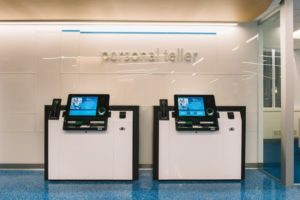 The PTM’s facilitate live face to face interaction on the screen; this lets the customer ask questions and experience the personal service but it permits the banker to help customers at multiple locations by remote interaction. “This prototype consisted of an entirely new space allocation due to the newer technology,” says interior designer Leanne Tanguay, “we had to consider how to make the retail space approachable and usable while fully incorporating Wings’ branding elements.